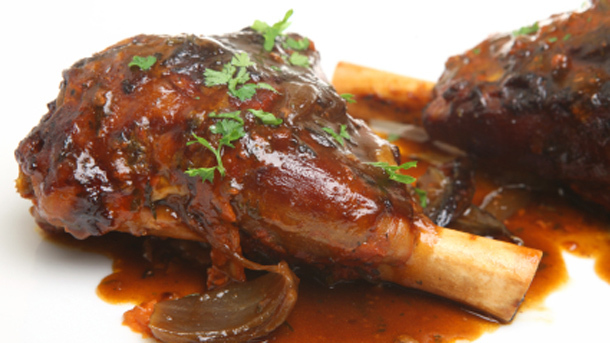 Salt and pepper lamb shanks, then brown in a heavy-based pan in small amount of oil. Fry off garlic and onions, carrots and celery. Add red wine, canned tomatoes, tomato paste and lemon zest. Return shanks to pan. Pour on enough hot stock to just cover shanks. Add thyme. Bring to the boil, cover and simmer for 1 3/4 hours, stirring occasionally. Once meat begins to fall away from the bone, remove from pan. Boil liquid until reduced by half.